From Leith Street to Princes Street, the Balmoral Hotel. Sometimes a view catches my eye and I have to stop and sketch it. Even when I have no time and really should keep moving! I had a great meeting today with James and Fiona at Concrete Wardrobe on Broughton Street. They are very excited to stock ES products and now have a range including prints, cushions and Christmas cards. On the way back up the hill into town I spotted this view of the Balmoral Hotel on Princes Street. Seen through the buildings on either side of Leith Street the clock tower looks stunning. I sketched in black ink, in my wee A5 pad, before adding colour digitally after scanning onto the laptop. 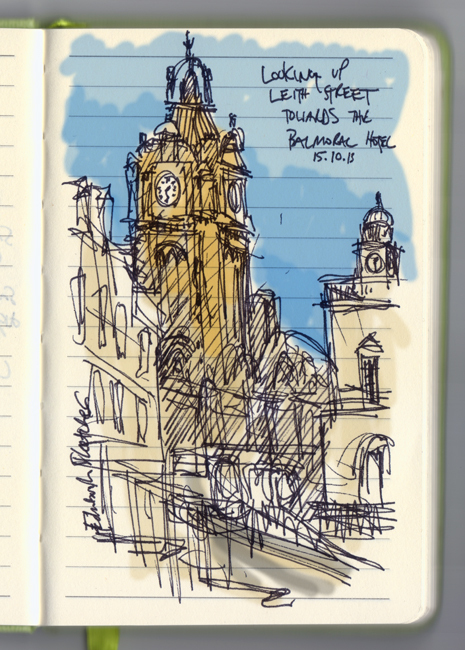 If you would like to sketch with me I am taking a small group on a drawing tour in Edinburgh this Friday (18th Oct). It’s free, open to all abilities and is part of this year’s Big Draw event. For more information follow the links below.